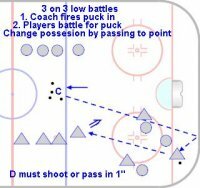 Keywords protect the puck, use evasive moves, skate puck out of the zone. avoid penalties, fight for possession. Keywords Defender close the gap quickly. Stick on the puck, body on body, defensive side, box out in the slot, tie up stick. Attacker protect the puck, make a quick move and go to the net. Screen, tip.